2019 Infiniti Q70 Trim Levels with Comparisons & Configurations. What 2019 Infiniti Q70 Trim Level Should you Buy? What is the Difference Between Trims? Sedans are perhaps the most widely utilized class of vehicles on the road in America today, as they offer plenty of power, interior room, and interior features to satisfy nearly every driver and passenger. These mid-size to large cars are perfect for bringing kids to school or for cramming vacation luggage into. 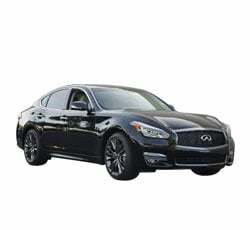 The Infiniti Q70 is a stalwart of the sedan class, offering a beefy V8 engine and a gigantic interior. There’s enough size inside to carry four adult passengers without feeling cramped, and easily enough can fit two adults and three children in the back. It’s comfortable to drive, and the car’s handling is quite responsive. This year’s model of the Q70 does not have significant changes from last year’s model, but not much needs to be changed in a vehicle that offers both luxury and practicality in one package. This Q70 is part of the first generation of Q70 vehicles, which was first introduced in 2014. There are two distinct trim levels available for the 2019 Infiniti Q70. The smaller Infiniti Q70 3.7 Luxe certainly offers plenty of features, and the 5.6 Luxe upgrades it further. There are also plenty of optional variants, including the Q70L upgrades to make the car longer and more spacious. There are also options on all trim levels to include all-wheel drive. This guide will help you decide exactly which trim level and which options are best for your driving style and your car needs. Compare the 2019 Infiniti Q70 3.7 Luxe vs 5.6 Luxe Trim Levels. What is the difference? The 2019 Infiniti Q70 3.7 Luxe is the base model available for the Q70 line. The numbers included in the trim levels’ names correspond to the engine in the vehicle - in this case, that engine is a powerful 3.7-liter V6. This V6 engine provides a strong 330 horsepower and 270 lb-ft of torque, easily enough to accelerate onto the highway even with a full set of passengers in the front and back seats. The 3.7 Luxe comes with a suite of interior features. You’ll find a manual sunroof that helps to light up the interior of the cabin, automatic climate control for both the front and back seats, and perfectly heated front seats. These front seats are also power-adjustable, so you’ll be able to find the perfect driving position without having to manually maneuver the seat around for an awkwardly long period of time. Even more interior features are added with the Essential package, which usually is already added to the vehicle for no cost. The Essential package includes heating for the steering wheel that pairs nicely with the already-included heated seats. It also upgrades your sensor and safety technology systems, giving you parking sensors and a top-down panoramic camera system to help you with navigation into or out of tight parking spots. You’ll also get a responsive touchscreen that measures in at 8 inches to help you key into the Infiniti InTouch infotainment system, and a 10-speaker sound system from Bose to play streamed music, audiobooks, or podcasts throughout the cabin. If you want an even bigger engine, then the 2019 Infiniti Q70 5.6 Luxe has just that. This trim has the V8 mentioned early, which measures in at a whopping 5.6 liters. This 5.6-liter V8 engine offers you 420 horsepower and 417 lb-ft of torque, getting you up to speed faster than you may be used to. You may want to customize either the 3.7 Luxe or the 5.6 Luxe with some of the packages available. Fortunately, most packages are available for both trim levels. The Sport package makes the Q70 more road-ready and speedy. It upgrades the wheels to a large 20 inches and tweaks the suspension to be firmer and more responsive. The exterior lines are slightly different in order to give the car a more sporty feel, and the brakes have been upgraded to brake faster and more responsively. The paddle shifters for the seven-speed automatic transmission have been upgraded to magnesium for more efficient shifting, ensuring you don’t lose any time switching between gears. Finally, in order to hear your music over the roar of the engine, the Bose sound system has been upgraded to 16 speakers instead of just 10. Another package that you may enjoy is the ProActive package. You may notice that the only safety technology featured in the base models of both the 3.7 and 5.6 Luxe trims is a parking sensory system. The ProActive package includes some other safety features, including front and rear collision mitigation systems that include automatic braking for maximum safety. It also includes front collision warning systems and lane departure warning systems, which can help by intervening in the situation by braking and guiding your car in the right direction. If you’re someone who tends to drive longer distances, then the ProActive package has one feature you’re sure to appreciate - adaptive cruise control. If you want a more premium feel for your 2019 Infiniti Q70, then you might opt for the Premium Select Edition package. This is somewhat more difficult to find but offers a special luxury exterior trim that features dark colors and accents. You can optionally include a rear spoiler, but more important are the upgraded brakes (similar to those found in the Sport package) and the 20-inch wheels. The interior is slightly more comfortable in this package as well, with premium leather used on the seating throughout and a mock suede covering the headrests. Outside of the engine upgrade, the 5.6 Luxe does not offer much that the 3.7 does not already have. Most packages are available for both trim levels, and you’ll be hard-pressed to find a reason not to upgrade with the ProActive package no matter which trim you choose. If you’re on a budget and don’t need a larger engine, then the Q70 3.7 Luxe is a great choice. If you want the vehicle to feel more sporty on the road, then you’ll also want to upgrade your preferred trim with the Sport package. Finally, if you want the car to feel luxurious, then you’ll want to search around for that Premium Select Edition package for either trim. Compare the 2019 Q70 3.7 Luxe vs Q70L 3.7 Luxe Trims. What is the difference? Both the 3.7 Luxe and the 5.6 Luxe have the option to get a long wheelbase, which is denoted with the Q70L moniker. The Q70L trim variants offer even more interior space, giving the rear seats almost 6 more inches of rear legroom (5.5 inches, specifically). There are also more features available for backseat passengers, which could be ideal if you plan on having this car around while your children grow up. These rear seat features include a 12-volt outlet for phone or game console charging and rear heated seats for those cold winter days. The rear doors also become powered, allowing them to be closed softly without needing to slam them every time. Packages for the Q70L trim variants are also slightly different. The Sport trim available for the Q70 base trims is shifted to the Performance Tire and Wheel package, which only gives the vehicle 20-inch wheels and larger brakes but foregoes the upgraded suspension and paddle shifters. An extra package for the Q70L is the Sensory package, which gives the vehicle a special interior trim and the 16-speaker sound system found in the base Sport package. An important note to mention is that all trim levels and variants can be upgraded to include all-wheel drive, which is denoted by an AWD at the end of the trim level or variant’s name. If you want the car to be able to have more traction on the road no matter the condition or if you know you’ll be driving on poor road conditions, then you may want to consider upgrading your vehicle with all-wheel drive. If you are planning on having multiple passengers of different heights in your car, then the longer Q70L trim variants may be a great choice for you. If you expect to have only one or two passengers in your car for shorter drives only, then you’ll likely want to get the base Q70 trims, which offer slightly better fuel efficiency and road feel. The 2019 Infiniti Q70 offers multiple great options with slight but important differences among them. If you’re looking to maximize bang for your buck, then the base Q70 3.7 Luxe with the ProActive package is likely your best option. It gives you safety features, some comfort features, and everything in the base model for a relatively low price. However, if you enjoy having a strong engine and don’t mind paying slightly more, then the 5.6 Luxe is an enticing option. Its V8 engine puts in work, making sure that you’re always able to maintain high speeds on the road. Of course, if you have more passengers or family members, then you’ll want to take a closer look at the Q70L trim variants. These offer so much more legroom in the rear seats that it would be wise to consider if you do have children.